Award winning Author, Lee Boyland, says Serpents Underfoot is a good first novel. Yesterday, I noticed that Serpents Underfoot had received another review, so naturally I went to check it out and discovered I had gotten another 5 Star review. This time from an award-winning author, Lee Boyland, Lee has several books out on Amazon.com. Check some of his titles out here! I posted Lee Boyland’s review here in its entirety. It really made me feel good to get this review and I am certainly working hard to improve my style in future works. Thank you, Lee, for your honest review. It is certainly appreciated. The story begins in 1966 in Vietnam and fills the first six chapters, then moves back to the US. A young US Army lieutenant is thrown from a helicopter inserting a patrol, injured, and then rescued by a Vietnamese girl who returns to the US as his bride. At this point the story transitions to their son, a US Navy SEAL. The author does a good job of describing the real Vietnam war on the ground, the inhuman crimes committed, not by the US but by the Vietcong and North Vietnam army. Hope some of the flower children now running the country read these chapters. Other reviewers have discussed the plot and in a couple of instances the books grammar and style. Monday morning quarterbacks who should attempt to write a novel. I am sure the author’s style will improve with future works. For me, the story is the important thing. Is the plot feasible? Are the characters believable? Is the action realistic? In this novel they all are. Smuggling ten small nuclear devices across our border is possible, however, the “suite case nukes” in the story would not be 2 KT. Considering their source, a yield of .3 to .5 KT would realistic. This said, a .4 KT nuclear detonation in a city would be catastrophic. Such small devices exist and in the US are referred to as SADMs, small atomic demolition munitions for use by Special Forces behind enemy lines. Isn’t that an awesome review? You can get your copy of Serpents Underfoot (Kindle) here, or paperback here. I would love to hear what you think of the book! Check out this great review from a Vietnam veteran! Anyone who reads Military Fiction will enjoy this book. DC Gilbert did an excellent job developing the characters and bringing them to life. I enjoyed the beginning, being a Vietnam Veteran, and thought it added to the plot of the story. The story has depth, and the author did an excellent job in fitting in historical events. It was evident that he did his research. I am looking forward to the next one! A word about the sequel, Montagnard! I added a new character to my sequel to Serpents Underfoot. This new character is amazing! He is … the Flesheater! Jim Hammond designed this amazing blade with input from Guru Arcenio J. Advincula. Guru Advincula is also a 1st generation Isshin-ryu Karate student of the system’s founder, Master Tatsuo Shimabuku. Sensei Advincula was a colleague and good friend of my Isshin-ryu Karate Sensei, Sherman Harrill. Jim Hammond and AJ Advincula designed the Flesheater as a highly effective fighting knife compatible with the fundamental mechanics of both Largo-Mano Escrima and Isshin-ryu Karate. The story of the Flesheater began when Master Chief Petty Officer Don Griffiths discussed fighting knives with his martial arts instructor, AJ Advincula. The Master Chief led the design and development research for the SEALTAC knives developed for USN Special Warfare (SEAL) Operations in the early 1980s. During one of the Master Chief’s visits to the shop, he accidentally experienced the cutting edge of the first prototype. The Master Chief exclaimed, “That knife’s a real flesh eater!” It seemed to be a very suitable moniker for the blade. I knew of the Flesheater sometime before my introduction to its capabilities because I have attended a few of Sensei Advincula’s Isshin-ryu Karate seminars over the last several years. However, the real introduction occurred when I began practicing Largo-Mano Escrima with Richard Rosenthal, a fellow long-time Isshin-ryu Karate practitioner and a student of Escrima for the last 15 years. Richard runs an escrima class on selected weeknights at the House of Hops in Raleigh, NC. Weather permitting, we train in the upper parking lot and then enjoy a few craft beers as well. It is a good time and a great workout! Of course, we don’t practice with live blades. I am partial to keeping my fingers attached to my hands. In addition, I am not too keen on being disemboweled. And, this blade excels in both areas of endeavor. Therefore, we use a hard rubber version of the blade. It is solid and will definitely leave bruises. Consequently, realism is not really an issue. Anyone interested can find the training version here. It is available from several third-party vendors. It will be interesting to see what part this awesome blade plays in Montagnard when JD Cordell and a few of his fellow SEALs return to Vietnam on a mission that is highly personal in nature! Certainly, whether hacking your way through a hoard of crazed terrorists, the dense jungles of Vietnam, or simply cleaning your fingernails, the Flesheater is the blade you should have on hand. Read more great posts by clicking here! Happy Veterans Day Giveaway: Thank our veterans! Kindle give away for Serpents Underfoot! Happy Veterans Day! In honor of Veterans Day, the Kindle version of Serpents Underfoot will be available from Amazon.com for free on Sunday, November 11th and Monday, November 12th. There are no gimmicks or requirements! However, if you were to enjoy the book and want to give me a review on Amazon, I would not strenuously object. And, a few Happy Veterans Day cartoons! We all need to give Veterans Day and our veterans the respect they deserve. Members of my family have served this nation going all the way back to the Revolutionary War. Several of my best friends have been Vietnam Vets. This is not unique and I am sure there are many families like mine. People who love this country and are willing to write that blank check to serve and protect it. When you see a veteran … thank him, shake his hand, or even buy his lunch. He has certainly earned it! Writing is not a get rich scheme! So you want to write? That is great! Here is a great tip. Don’t quit your day job. Success can come, but it is a marathon, not a sprint! Writing is certainly very cool! I love to write! And, the fact that I have a published novel, a counter-terrorism action/thriller, selling on Amazon.com amazes me to this day. It is pretty damn cool! Serpents Underfoot has been on the market for a little over a year now. It has gotten a lot of great reviews. I believe it currently sits at about 17 reviews. And they are mostly five star. Success takes time and hard work. So far, I have managed to sell about 100 books through Amazon.com. This does not count books I have sold myself at book signings, or have given away for promotions. I work hard at marketing. I am working with a marketing consultant, spending time using Twitter, Pinterest, Instagram, blog posts, and other media formats trying to promote my book. The point here is that it is a lot of hard work. It takes patience and dedication. I put in some long nights, because in addition to all this, I also have a day job. Why am I doing this? Because, I am going to succeed! So, to repeat, I have sold 100 books through Amazon.com over the last year. Given that the average number of sales for a self-published book is 20 copies, I think I am doing pretty well. The point to all this is that, if you are looking for a get rich quick scheme, this is not it. The chances of writing that instantly successful novel that sells millions of copies in the first six months is about a good as hitting the powerball in a state lottery without first buying a lottery ticket. The people who self-publish full time will tell you that they spent years getting to where they are today. So, it’s better that you don’t quit your day job! Just keep plugging! Write, learn from your mistakes, and don’t quit! The Vietnam Veterans Memorial, also referred to as The Wall, in Washington DC, is a late but wonderful first step in welcoming home Vietnam Veterans. Etchings in Stone is an unbelievably moving play written by Ron Harris about The Wall from a very unique perspective. I met Ron Harris, a North Carolina Vietnam Veteran, at the Raleigh Museum of History during a Vietnam Veteran’s Day event. This event featured the mobile “Wall” exhibit, a Huey (bringing back my own fond memories of my time with the 101st Air Assault Division), and other Vietnam War memorabilia collected and displayed by the Vietnam Veterans of America. While looking at a great 3-D diorama of the Chu Chi Tunnels of Saigon (now Ho Chi Minh City), a man came up and asked if I had any questions about the diorama. We began to talk about the Chu Chi Tunnels and other dioramas he had built and that were on display. During the conversation, I disclosed that I had written a novel that begins with the story of my main character’s father fighting in Vietnam, titled Serpents Underfoot. Ron then told me that he’d written a play called Etchings in Stone about The Wall, and that it was showing every hour in the museum auditorium. I decided I needed to see this play. We talked a bit more before I headed toward the auditorium to see Etching in Stone. I was not entirely prepared for what I was about to experience. The play features about twenty-one segments, or stories, about visitors to The Wall. Ron took the unique and extremely moving perspective of placing the audience inside The Wall, and giving them the ability to hear what the visitors were saying as well as their unspoken thoughts. The effect was moving beyond belief. Each visitor approaches The Wall looking for a name … a father, a husband, a brother, an uncle, or a fellow soldier, sailor, marine, or airman. You hear their words as well as their thoughts. One emotional soldier thanks a medic for saving his life. Then there’s the widow who misses her husband dearly. And, the father or mother missing their son. We meet a woman missing her older brother. There’s even a soldier apologizing for accidentally shooting his buddy because his buddy had not given the countersign when challenged upon entering the defensive perimeter. The anguish was very real! It was palpable! The last segment blew me completely away. It featured a young Amerasian woman, who I later learned she was played by Ron Harris’s adopted daughter. The young woman approaches The Wall. We learn that she is the daughter of the an American soldier and a Vietnamese woman. The soldier planned to marry her mother, but is killed in action before that could occur. The mother, with little chance of making a life for her daughter, puts the baby up for adoption. The baby is adopted and raised by a wonderful American couple. While the young woman loves her adoptive parents very much, she wants to know who her real father was. She seeks help from the U.S. military but they have no records of who he father might have been. She contacts other Vietnam Vets, but they are unable to help her either. The young woman then returns to Vietnam and locates an aunt who tells her that her mother died and never talked much about her American fiance. He aunt is very sorry, but she cannot help her. The young woman finally comes to The Wall to pick a name … a name to be her father. But, when she sees the number of of names on The Wall, she is completely overwhelmed. How can she choose only one? The woman decides to choose them all … they will all be her father. And that way, in the future, if anyone should ever asks if her father’s name is on The Wall, she can answer truthfully … yes. I do not know if it was intended this way, but between segments of Etchings in Stone there are power point slides that include interesting facts about the Vietnam War and The Wall. There is also music from the era, video, and still photos of the Vietnam War. There are interviews with veterans and songs about The Wall. The play is entertaining, extremely moving, and very educational. A shift in America’s conscience. This country always welcomed its Veterans home with open arms. That is until the Korean War. Korean War veterans came home to simple indifference. However, when Vietnam War ended, that indifference became outright disrespect and even hatred. Far too many Americans spit on these veterans, or called them baby killer and other names. These men and women only did the job their government had sent them to do. Therefore, in addition to the Post Traumatic Stress Disorder (PTSD) some suffered due to the effects of combat, many suffered an additional layer of PTSD caused by this treatment. This treatment of these American veterans was a national disgrace. While the Vietnam War certainly affected the men and women who fought it, it also had a profound effect on those who stayed home. The mothers and fathers, sisters and brothers, wives and children, girlfriends, friends and strangers were all touched by the war. This play, Etchings in Stone, addresses the issues that affected all these people, veterans, family and friends. It is Ron’s hope that through this play, Vietnam veterans will come to realize that they are not alone in their feelings. Thank you, Mary Enck, for your fantastic review! Mary Enck is the author of, A King in Time II. Mary Enck attended UCLA and holds an MFA in Creative Writing. She enjoys reading Fantasy and Science Fiction and has a new love for Mystery/Thrillers. Latest character crush is Jack Reacher. A native of the Colorado Rocky Mountains, and lives in Colorado Springs with her family, a Lab/Dane doggo who says her name is Gillie, and two cats, Lucky and Tuxedo. Being a long-time fan of the Arthurian legend and having read several versions during my life, I certainly am going to have to read hers as well. In fact, I just started reading it. I am sure there will be a post about A King In Time on here in a little while. However, the purpose of this post is to thank her for her fantastic and thoughtful review of Serpents Underfoot. Her review left me humbled and speechless. Author, D. C. Gilbert, takes the reader back to a time that has passed into history. While the era is overshadowed by so much that is happening today, at such a rapid pace, this story reflects how little we have advanced in all this time. We remain in conflict with humans, inflexible in their beliefs. The characters are very strong in their individuality. Again, it is interesting to see the contrasts drawn between the West and influences from another time and another faraway place. I became related to the good guys in this book. I enjoyed their personalities and like them very much. There is a lot of delving into the way of things such as martial arts, Navy Seals and their working dogs, which I especially liked. To me, if there is an animal in a novel significant to the story, it is a relief from the more severe issues that come up. If interested, you can read the complete review here. 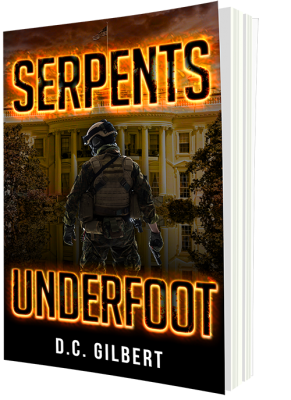 The novel, Serpents Underfoot, is available in Kindle format for only $3.99. I hope you will give it a read!